The assembly programme continues to feature a rich and diverse range of speakers and topics, with a large number of students getting a chance to speak in an assembly over the past year. The main theme for the year has been “awe and wonder” which has given many departments a chance to tell us what is great about their subject. Teachers and students have spoken about their academic passions and we have enjoyed some fabulous images, animations, music, videos and even a live outdoor Chemistry demonstration which was streamed to the computer in the Main Hall for everyone to watch on the big screen. I particularly enjoyed Mr Roberts’ illustrated tour of his favourite trees in the Hymers grounds and Mr Simpson’s passion for the Mathematics of shape and dimensions. In addition to this, we have had many students reporting on trips and sporting fixtures, some excellent visitors to the school talking on a wide range of subjects, and some brilliantly witty talks from James Grundy on his favourite subjects of flags and etymology. 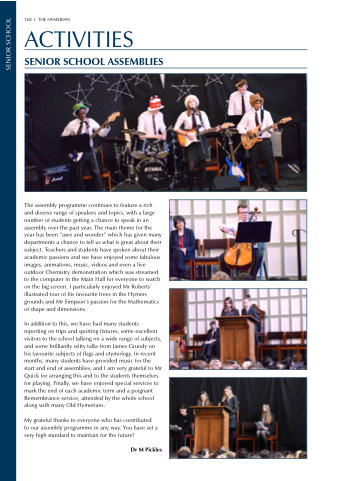 In recent months, many students have provided music for the start and end of assemblies, and I am very grateful to Mr Quick for arranging this and to the students themselves for playing. Finally, we have enjoyed special services to mark the end of each academic term and a poignant Remembrance service, attended by the whole school along with many Old Hymerians. My grateful thanks to everyone who has contributed to our assembly programme in any way. You have set a very high standard to maintain for the future!